We worked our asses off last night in South Carolina doing a “black tie dinner”. (See the previous posts on Kiawah). But we had a good time and made our food pretty darn close to the way I hoped it would be. The Ocean Room team led by Chef Nate Thurston did an outstanding job of providing muscle and know how. 3 canapés and a 5 course dinner all in kitchen we had never been in before until yesterday and working with a team of folks we just met is not something to take cavalierly. Our new “Norman’s at the Ritz Carlton Grande Lakes, Orlando”, Chef-de-Cuisine Camilo Velasco proved to be an excellent asset to our team. He is a strong yet gentle person and I like that about him. Without the strong part his gentle would never make it to his position of course but his quiet intelligence is keen though it purrs. 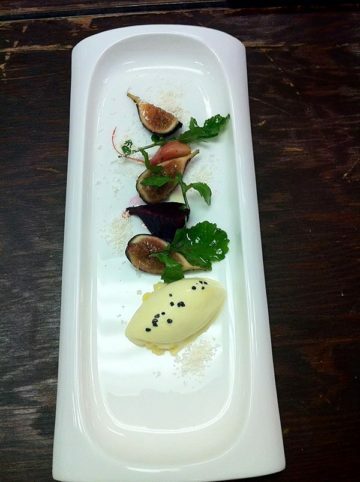 Justin made the single best thing of the day with his “Corn Ice Cream” which went on a Beet, Goat Cheese and Fig Salad. The textures and flavors were perfect. I am looking forward to seeing/tasting many of the kinds of ice creams he makes with the evolving roster of seasonal fruits we have to work with in South Florida. Our next “out of town gig” will be in Atlanta for the Atlanta Food & Wine Festival. This is the “MUST GO” event of the Spring! This event is going to blow up big just like the South Beach Wine and Food event did. No one seems to remember how easy it was to get into the events that first year on the white sands off Ocean Drive, Miami Beach back in the first few years. Atlanta will become like that, mark my words! May 20-22 in Atlanta is where you all want to join us. Go to atlfoodandwinefestival.com and see why I’m so excited! Justin and I will be teaching a class on Exotic Fruits. Guest will learn, taste and enjoy Mamey Sapote, Mangos of all kinds, Passion Fruit, drink a Batido, (you will learn more about that there!) etc. etc. Our friends from The Fairchild Tropical Garden are lending their big green thumbed hands! The even here in Kiawah goes on for two more days. But now its time for me to gather up the troops and head into Charleston for some more Southern Flavors there!